Hull sold 6 February 1922. 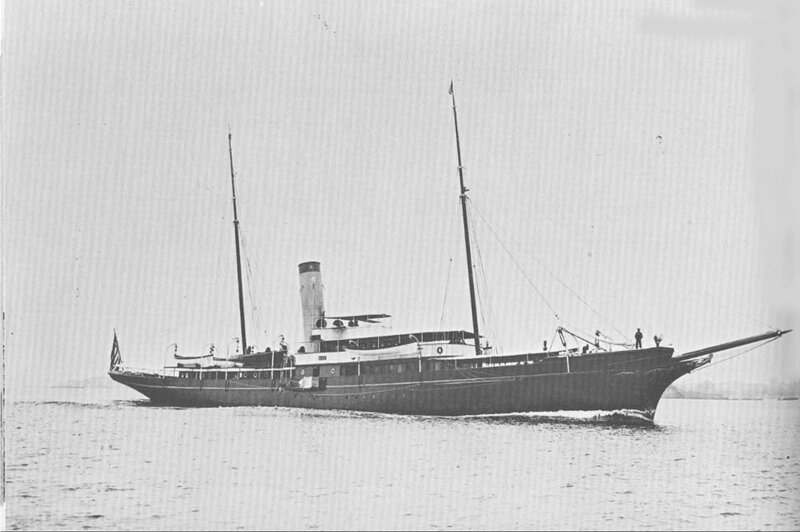 52k At anchor, prior to World War I. 95k Photographed prior to her World War I era naval service. 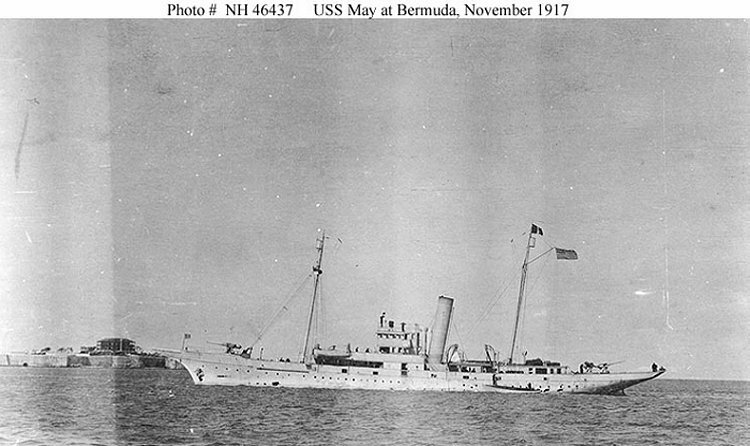 77k At Bermuda in November 1917. Photographed from USS Margaret (SP-527). 85k Tedford Harris Cann (September 3, 1897 - January 26, 1963) was a champion American swimmer and a recipient of the United States military's highest decoration, the Medal of Honor. He served as an officer in the United States Naval Reserve during World War I and earned the medal for saving his sinking ship. He served in the Navy Reserve during World War I, initially as a Seaman. On November 5, 1917, while he was a member of the crew of the patrol vessel USS May (SP-164), Seaman Cann voluntarily swam into a flooded compartment and repeatedly dived beneath the surface until he had located and closed the leak that endangered the ship. He was awarded the Medal of Honor for this act. 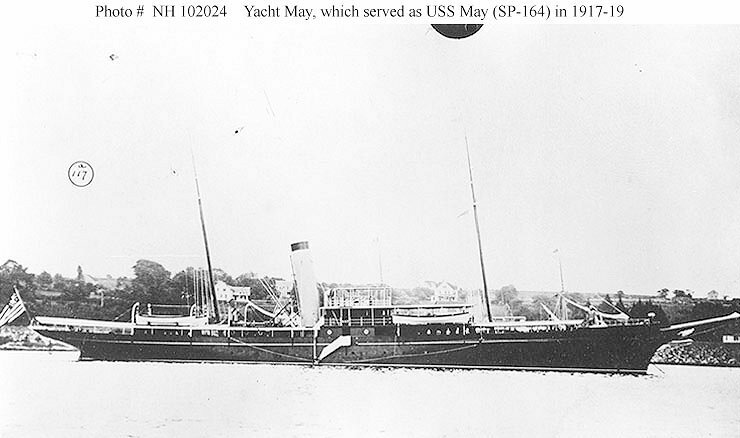 In April 1918, Cann was commissioned as an ensign in the Reserves, continuing to serve in the USS May into July. He spent the rest of World War I as an officer on the USS Noma (SP-131) and left the service shortly after the conflict's end. 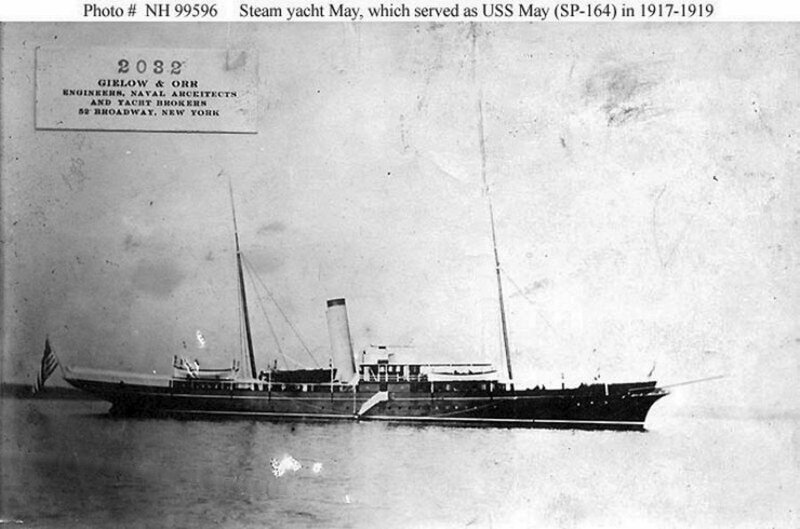 Dictionary of American Naval Fighting Ships History: May, a steam yacht built in 1891 by Ailsa Shipbuilding Co., Troon, Scotland, was purchased by the Navy from J. R. De Lamar 11 August 1917; and commissioned 7 October 1917. Operating out of New London, Conn., May patrolled along the Atlantic coast and in the Caribbean during World War I, protecting vital Allied shipping from German U-boats. She ran aground on a reef off Santo Domingo, 27 July 1919; after efforts to refloat her failed she was declared abandoned 28 February 1920. Her hulk was sold 6 February 1922.